I am a cookie dough junkie. All through my last pregnancy, the hardest thing for me to stay away from was cookie dough. I had to stop making cookies all together so I wouldn’t accidentally end up with some of the dough in my mouth. Shortly after my daughter’s birth we had a potluck and one of my husband’s sisters brought these. I can’t tell you how many times I have had them since. If only I had discovered them when I was pregnant! They are delicious, easy to make and raw egg free. Mix together the sugar and butter then add the vanilla and peanut butter. Mix well and then add the flour and condensed milk. Mix until smooth, stir in the chocolate chips. Press into a baking dish. 8X8 will get you the thickness you see here, but you can use a larger pan, they just won’t be as thick. Microwave the remaining peanut butter and chocolate chips for approximately one minute, stir until smooth, microwaving for a little while longer if necessary. Spread it over the top of the cookie dough. Refrigerate the entire dish for at least 3 hours before serving. OMG those sound SO good. I need to try those. Oh yum!! Just one more thing to make me fat! 😉 Looks easy and delicious! 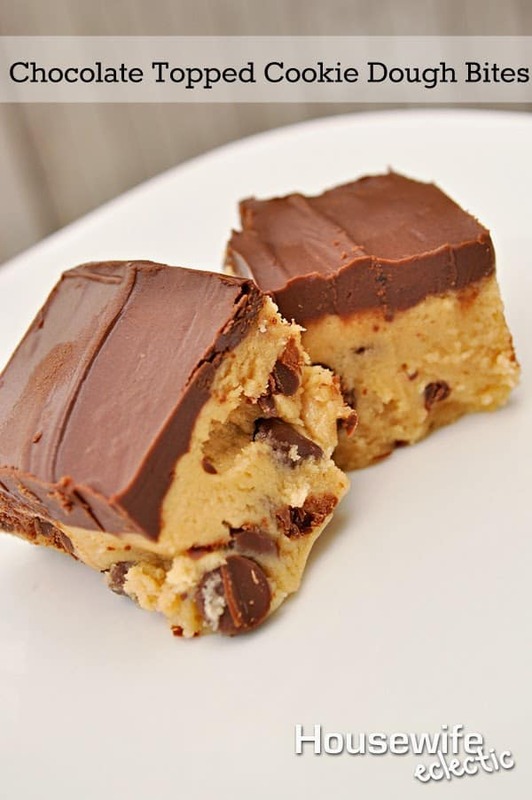 Wow, those look truly amazing – I absolutely love cookie dough! These looks so yummy. Just need a glass of milk and wl be a great snack idea. That looks so good! I love the combination. This recipe is making my mouth water! it does sound to good to be true! Those look like just what my sweet tooth wants! Those look delicious! I definitely need to make these soon! OMG this looks so good. i'm going to have to try it this weekend. oh these look fantastic. I need to make them now.